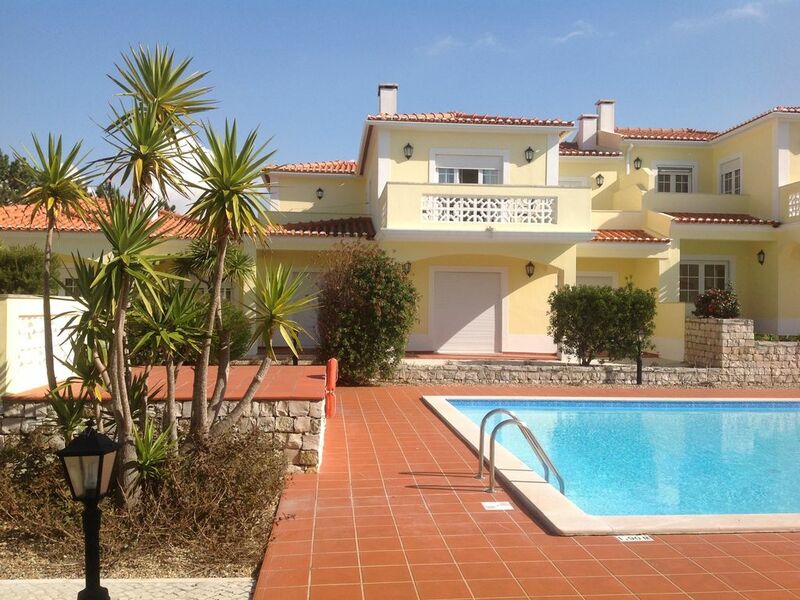 2 bed apartment overlooking golf course and pool. Short walk to sea. This property is situated in prime location on a 5 star resort. Beautiful Atlantic surf and an additional inland lake for safe swimming, water sports, etc. Excellent Golf course on site, horse riding nearby and tennis (clay courts). Apartment has 4 large terraces for all day sun. Rear of property facing 6th tee and 200 metres from driving range. Nearby village has all amenities, supermarket, pharmacy etc. Spa/Gym and hotel facilities available at local Marriott hotel and the beach is on a few hundred metres away. Numerous other places of interest to visit. Please contact owner for more details. Please check availability calendar before enquiring as this is always up to date. Not required in Praia del rey. Buildings are warm in winter , cool in summer. Heating will be charged after your stay and to be used by prior arrangement only. From Dec to Feb heating included in price. Cleaning is done prior to and after stay. If mid stay change of linen required cost will be extra by prior arrangement. Not to be used. Decoration only. At nearby hotel. Can be used for a fee. We have a few DVDs and CDs but feel free to take your own. Have a few which past guests have left. Again take your own as well. Can also be hired from Vila da Praia down road. Now heated until late September. Sun loungers, patio furniture on all terraces. BBQ at pool below. Thank you for your comments. I hope you had a great holiday. The property was fine, well furnished, clean, and tidy. We did not enjoy Praia del Rey. The apartment was fine - clean, well furnished, and tidy. The swimming pool in front of the house, supposedly heated, was a joke. The heat did not kick in until well into the afternoon. At the back of the house was the first hole of the local golf course. The internet newly installed to the complex was non-existent, yet all the tenants seemed to accept the situation. Apparently this lack of internet is being looked into. Entertainment in the area is non-existent, unless you consider sitting in the Golf Club House, night after night, paying high prices for basic meals. Access to the complex is down a broken road which runs through a tree plantation for about two miles (don't arrive at night - it will terrify you). In fact, the towns surrounding the area are pretty run down. The beach has NO FACILITIES! The sand on the beach is, well, okay, I suppose. The nearest towns are essentially for sight seeing or shopping. Nothing for children that I could see. To say that I'd paid for a 14 day stay, but left after 5 days and drove over to Spain, may better indicate what we thought of the area. As I say, the apartment was fine, and the complex was well maintained, but if I could have picked it all up, and sited it somewhere else, we may have enjoyed it better. I lost money, but it was worth it to get some enjoyment out of my yearly break. Oh, yes, the welcome pack was not worth the money we paid. I would not recommend Praia del Rey, but, the apartment was fine. So sorry Praia del Rey was not for you. However all the descriptions in the advertising explain exactly what's on offer and we have never had any problems like this before. Most people love the area and its culture and kids normally enjoy holidays there as we have pool beaches, tennis, golf, kids club, surfing, horse riding etc. In the evenings you can explore the area and numerous restaurants and busy beaches close by. If you wanted the Spanish way where everything is on the doorstep, maybe you chose the wrong place. Portugal is beautiful and there is loads to do if you look for it. If you given it time it would have proved to be one of the best holidays you ever had. Internet was not advertised, but you can get it easily 200 metres away at the golf club and at the local hotel, where also there are numerous activities as was advised. However most people on holiday can manage without it for a while. nous avons passé un très bon séjour dans cet appartement très bien agencé et très bien équipé tant au niveau de la cuisine que du linge le lit ou les jeux de plages. la literie est de très bonne qualité et la résidence est très calme. L'environnement est d'une propreté irréprochable et la piscine est nettoyée tous les jours. attention le canapé n'est pas convertible donc si vous êtes 6 prévoyez le couchage pour une seule personne. Nous remercions le propriétaire qui est très sympathique et qui répond à toutes nos questions très rapidement. Nous recommandons vivement cette location et reviendrons sans problème. I am sorry you couldn't work the sofa bed. You just needed to ask our lady if you had problems as advised. My husband and I have just spent the last 4 nights on it and no other guests have been unable to work it out. All you do is pull out the base. Simple. So pleased this didn't spoil your holiday. The flat was nice as expected . If you like it very quiet that is the right place for you. The access to the beach is through the Marriot or at the end of the resort. Alternative access is through a golf hole 700 m from the flat. Thank you for your great comments. We always make sure our guests have everything they need and welcome you back again soon. We stayed at the apartment in September 2010 and 2009. I would definitely recommend this apartment to friends, it was immaculate, well maintained and exactly as portrayed. Club House very good restaurant excellent service and good and within walking distance of apartment. You need a car to get around tothe lovely villages and beaches. The beach near the apartment is fabulous with atlantic waves and miles and miles of golden beaches. The area is completely unspoilt and very relaxed with no night clubs, making it perfect for families. You can find a few local restaurants and excellent facilities in nearby towns. There is a children's club onsite, with many activities including quad biking, archery, cycling and paint balling. For older kids, there is a bar and surfing. The nearby town of Peniche has boat trips to nature reserve island, where you can scuba/ snorkel as well as a good selection of restaurants and a water park. The property is 40 minutes North of Lisbon, allowing for a day trip to this fascinating city whether you're looking for culture or a great place to shop! The medieval walled town at Obidos is also well worth a visit and there are many museums in the area, as well as go-karting for the children! We take No liability for accidents or injury however caused. Children must be closely supervised on balconies and around pool. Cots provided at extra 8.00 per night.